I have a feeling that Steven Moffat commissions Doctor Who stories on concept rather than on actual plot. A lot of the episodes seem to have a great idea at their heart, but which then fails to work as an actual piece of television drama. 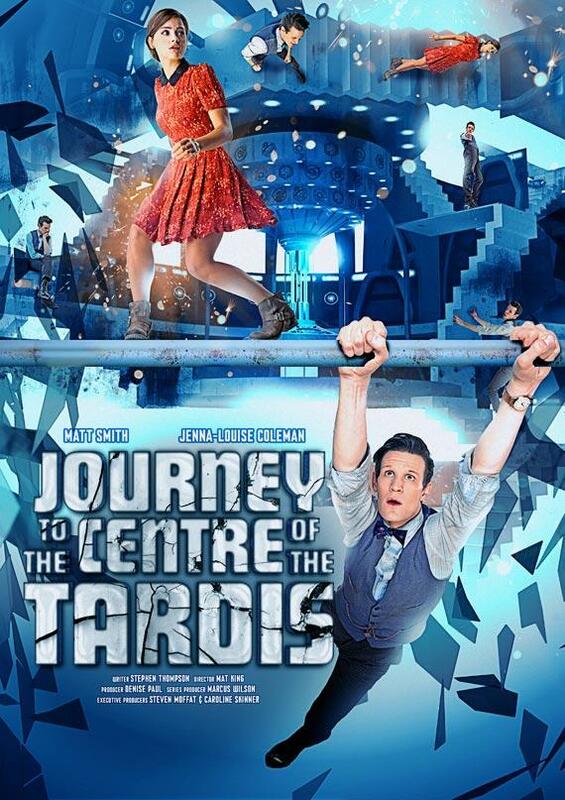 'Journey to the Centre of the TARDIS' is one such idea. Moffat seems to be a little obsessed with the TARDIS - we have seen it personalised in 'The Doctor's Wife' and destroyed and blown up countless times ... and now we get to see a lot more of it! So ... hmm ... the Doctor is now outside the TARDIS somehow, but Clara is still inside, and there's three black guys, one of them apparently an android who can 'feel' the TARDIS. The Doctor has the bomb-thing from one of the guys - it's a Magno-grab remote apparently - and the TARDIS' fuel lines are broken. So the Doctor recruits the three guys to help him rescue Clara. But the ship is full of poison fumes, so they need respirators to get in there ... except that it's not as Clara is actually fine and wandering down corridors which thankfully are not covered with roundels. In fact, I quite like the TARDIS interior, though it's a little sterile perhaps. The shape of the corridors and the doorways are nicely designed. Clara's dress, however, is just awful - very old maid. So the Doctor vents the poison gasses (which weren't there), and he pretends that he has set his own ship to self destruct in 30 minutes if they don't find Clara by then - this is all mental! So Clara wanders about, finds a room full of junk - River Song's cradle is there, and Amy's TARDIS model - as well as a monster which seems to be following her/chasing her for no discernible reason. I wondered if they were perhaps TARDIS anti-bodies which it had released to try and repair the ship - maybe by using human parts to do so ... at least that thought was more original than what we got! There's a room with a machine-making device - an Architectural Reconfiguration System - which looks like the Animus off of old sixties Doctor Who (and which some suggest was in fact The Great Intelligence - ahah ... perhaps I am onto something here ...) with glowing light bulbs as 'fruit', and one of the guys takes one of them ... but the ship won't let them go if he has it ... but he takes it anyway and nothing seems to happen ... just one of many totally random bits of nonsense that litter this script. Another of the guys dismantles the console and we hear whispered voices - which is actually really neat - from other stories. I spotted Susan and Ian from the first ever episode, and the 9th Doctor going on about Genghis Kahn. (Apparently the full list is: 'An Unearthly Child', 'Colony in Space', 'The Robots of Death', 'Rose', 'The Beast Below', 'Smith and Jones', and 'The Doctor's Wife'.) Meanwhile Clara finds a library (having passed a telescope room and a swimming pool) and a book called The History of the Time War and, on looking at a couple of pages, comments: 'So that's who ...' Interesting ... also corny and deeply cringe-inducing. So they all wander around some more, get confused as to where they are as the TARDIS is trying to trap them as they have that globe thing, they get back to the console room, except it's not the console room but an echo of it, and Clara is also there, but she can't be seen by the others but she can be heard, and there's a monster, and it attacks her, but the Doctor finds her and pulls her into his echo version of the room and ... what???!!! I have literally no idea what is going on. The Doctor tries to turn off his fake countdown, but the ship is going to explode anyway, so they head for the centre of the TARDIS. By this time I've lost the will to live. Monsters are circling them but not attacking for some reason. The Doctor seems to know that one of them is a 'she' ... But then they are attacked by metal needles punching through the walls, and the Android guy is pinned ... but he's not an android but human - his brothers have pretended he's an android to stop him being leader or something - a subplot which sort of got lost I suspect in the editing/rewriting of the story (at least I hope that's what happened). 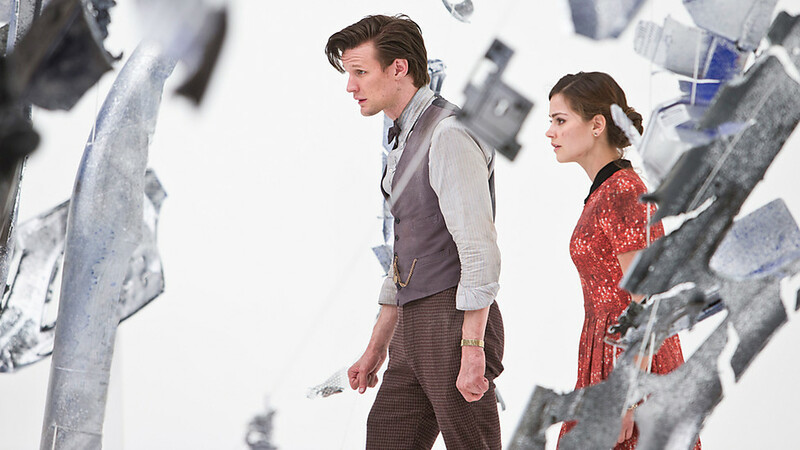 The Doctor reaches the power source - the Eye of Harmony, or room with an exploding star in the sky - and one of the guys' Alien-like sensors identifies Clara as 'Lancashire. Sass'. Now it gets even more confusing if that's possible. Monsters attack, they get killed by being pushed off the walkway, but then one of them is also identified as 'Lancashire. Sass' and Clara realises it's her. Another is the Doctor (with hand over its face) and a conjoined duo are two of the black guys ... something to do with leaking time and this is their future perhaps? 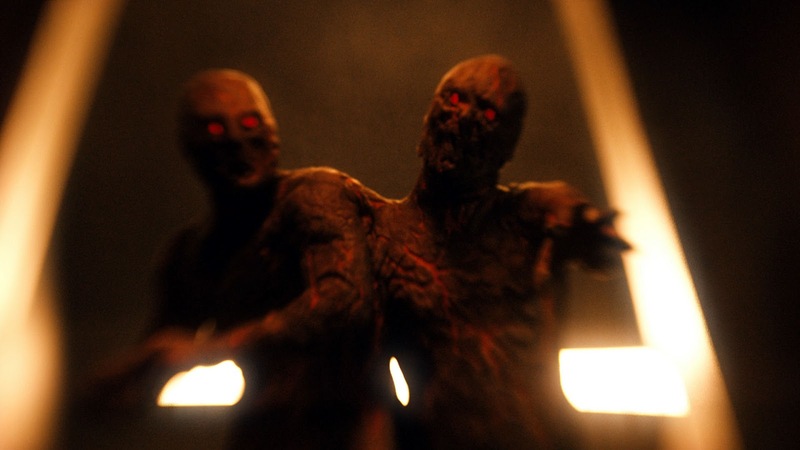 The brothers turn into the conjoined duo after they kill them, and the Doctor and Clara escape. So the Doctor and Clara head to the Engine Room, which seems to be outside by a crevasse ... except it's not, it's just an illusion. But they spend some time with Clara wondering who the Doctor is as she saw his real name in that book ... so they jump and end up in a void where time seems to have stopped ... the engine is exploding, but the TARDIS has stopped time to prevent it. Or something? But Clara has a backwards 'Big Friendly Button' written on her hand from when she picked up the unexplained remote thing at the start ... so the Doctor writes 'Big Friendly Button' on the remote he has, and uses a very convenient time rift in the engine room to throw it back in time into the TARDIS at the start of the story ... and this time the Doctor grabs it and pushes the button to stop everything from happening in the first place. Yes ... it's a great big effing reset button. The most obvious and derided McGuffin of them all in Time Travel stories. I just don't know how the production team had the gall to use it! So the TARDIS is not destroyed, Clara does not find out the Doctor's name as written in The Book of the Time War (and who wrote that book anyway - I thought the Time War destroyed everything!) And the black guys stop making fun of their brother and pretending that he's an android. It says everything about this story that I have no idea what their names are. One is called Tricky - he's the not-an-android one - but the other two? No idea. And actually I don't care. Frankly, this is rubbish. It's boring to watch, and even the CGI can't save the tedious nonsensical plot, the running about, monsters which are there for no reason, lack of coherence in every aspect of the storytelling, and hanging threads and ideas which are not developed. It's as though they just threw everything they had into a story about going to the heart of the TARDIS, with no awareness of how or why that might be at all interesting to the viewer. Way back in the day, we had a TARDIS tale called 'Inside the Spaceship' and it was actually the third transmitted story. This two-parter is superior in almost every way, delivering psychological tension and drama instead of empty visuals. Even in 'The Deadly Assassin' we had ideas and concepts of being within a pan-dimensional matrix which were better thought through and executed than this mess. Really, it needed to be rewritten from top to bottom, starting with what the point of it all actually is. There's no message, no theme, it's just a runaround. We don't even discover anything about the TARDIS. Another series I'm reminded of is the 'Inside the Robot' episode of Lost in Space, where the Robot is made giant-size and Will and Doctor Smith have to get inside it to save it ... even that, hokey and sixties kitsch as it was, is better than this. I keep coming back to this same point ... Doctor Who works when it's not about Doctor Who. It is best when presenting adventures in time and space. With horror. And monsters. And plots. And characters you care about. The moment you start worrying about the mechanics of the series, and start to make it be about its own mythology, or about the Doctor, then it all falls apart. This is what has ruined so many other series, making them steadily more impenetrable to a general viewer so that people just turn off or over. I don't want that to happen to Doctor Who. Ever. It's such a shame that after two cracking episodes, that this has to come along and let the side down so badly. Such a shame.